Malcolm J. Fraser Jr., professor of biological sciences at the University of Notre Dame, has been elected a fellow of the American Academy of Microbiology, an honorary leadership group within the American Society for Microbiology. The election recognizes Fraser’s long record of teaching and innovative research, especially in the fields of virology and transgenic engineering. Fraser discovered the piggyBac transposon, characterized its function and developed it as a “universal” transgenesis system. The system has been applied in many medically and economically important species that previously lacked efficient transformation systems, including the malaria-causing protozoan parasite, disease-carrying mosquitoes, silk moths, and grain beetles. The piggyBac system also is used as a tool for transgenesis in mouse and other mammalian systems, and is the preferred method for reprogramming mammalian cells, including human cells, to functional pluripotency, providing a viable alternative to embryonic stem cells. Among other things, the discovery could advance the search for a cure for neurodegenerative diseases such as Niemann-Pick Type C, a deadly genetic children’s disease. Fraser, who holds several patents, has received a prestigious Gates Grand Challenge award to develop innovative approaches to controlling mosquito-borne viral diseases. His recent work includes using piggyBac transformation to engineer novel dengue virus specific suppressor genes into mosquito cells. These suppressor genes act by specifically detecting an infecting dengue virus within the mosquito cell and inducing apoptotic cell death, thus averting transmission of the virus – an approach called “death upon infection.” He also has been instrumental in the recent successful development of transgenic silkworms that synthesize and spin artificial spider silks, providing not only a process for custom protein fiber engineering, but a means for commercial scale production of this important biomaterial as well. Fraser is a member of the Eck Institute for Global Health, which recognizes health as a fundamental human right and endeavors to promote research, training and service to advance health standards for all people, especially people in low-and middle-income countries, who are disproportionately impacted by preventable diseases. In addition to his innovative research, Fraser has enjoyed a long and successful teaching career. He has taught General Virology for 25 years and a course on AIDS for about 20 years, as well as participated in the teaching of the General Biology curriculum for the past three years. 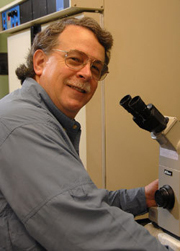 Fraser will be recognized as a fellow at the American Society for Microbiology’s General Meeting in New Orleans in May. Originally published by Marissa Gebhard at newsinfo.nd.edu on March 15, 2011.